The Great Online Shopping Festival or GOSF has started from today, and the deals and offers are even bigger. Into it’s third year now, GOSF is one of those highly anticipated shopping event within the Indian ecommerce, and the shoppers won’t feel down. GOSF is organized by Google to encourage and promote online shopping among Indians. Sellers offers special deals and promotional plans for GOSF, which are lapped up by eager consumers. This year’s GOSF is happening between December 10th to December 12th, and Google has roped in 450 sellers for this mega event. Interestingly, Flipkart has decided not to participate in this year’s GOSF. Real Estate is one of those popular categories this year, 36 vendors have participated in this event, and offering heavily discounted deals. Tata Housing is one of the prominent participants in this niche, as they have offered properties worth Rs 13 crore under special pricing. During last year’s GOSF, Tata Housing was able to sell properties worth Rs 25 crore as more than 50 apartments and offices were booked during the event, with 40% of the bookings coming from Tier 2 cities, and 30% from NRIs. They have even released a small TV commercial in that regards. Check it out! Properties starting from Rs 35 lakh to Rs 3.5 crore are at display at Tata Housing’s section in the GOSF portal, and bookings can start by paying as low as Rs 50,000. Special payment arrangement and prices have been announced, especially for GOSF. 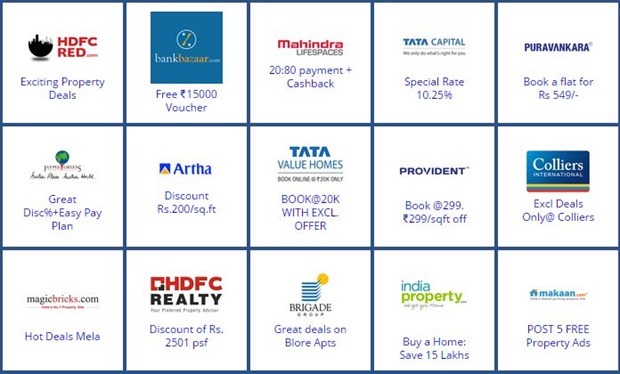 A separate division of Tata Housing: Tata Value Homes are also offering special sales of real estate with booking amount as low as Rs 20,000. Besides Tata Housing, other prominent real estate firms such as Artha Properties, Puravankara, Colliers International, HDFC properties, Brigade Group, Raheja Group and others are also participating with several interesting deals. In August this year, Tata Housing had partnered with Snapdeal to sell apartments and homes online, with special low booking amount. It seems real estate is now slowly becoming mainstream ecommerce commodity, as more and more consumers are preferring ecommerce portals and platforms to choose their dream home. Before you delve deep into the charisma of GOSF, here are 7 mistakes you should definitely avoid! As a side note, have you checked out other deals on GOSF? If so let us know how did you find it! We are reserving our comments right now as we have not witnessed a single significant deal on the site as yet..Did you come across any? "GOSF 2014: Tata Housing & 35 Other Real Estate Companies Offer Huge Property Discounts", 5 out of 5 based on 1 ratings.